If a macro results in an error or doesn't do what you expect it to do, you can now collect logs and send them to our support e-mail address for investigation. Yes! How embarrassing, I should have tried that right away. Interestingly (you probably already know this), it fixes it for the macros which are already downloaded. If you then download another, once again it is "Other", but if I restart again, that latest one is also correctly recategorized. Since I tend to restart OneNote at least every day and sometimes more often, this is good enough for me. Thanks! DadsHomeKids: Does restarting OneNote fix the issue? 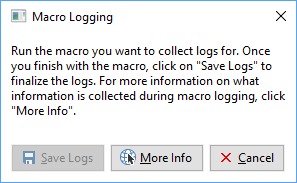 This is a great feature for logging issues during a macro. But the problem I'm having isn't running a macro, it's during installation, hoping some user can help. Since I upgraded to 3.13.1 (32 bit), any macro I download ends up in the "Other" category - that is, it's under a button on my ribbon which says Other. Until now the macros were under a button labelled with the category associated with them. (Already installed macros stayed where they were). Has anyone see this and/or have a fix? Thanks. THANK YOU SO MUCH!!! Really needed to crop photos in OneNote and could not believe Microsoft does not support this. THANKS! I just read that Microsoft will sunset OneNote 2016 and have only the OneNote uwp available starting later this year. Will Ontastic be able to work with the app? I hope that this is the case as I dread not having the addins from Ontastic. Please add table background properties (NOT highlightcolor) !!!!! fromCharCode: Currently you cannot delete objects. If the images are inside Outlines, you can find the parent Paragraph of the image and set its .text to empty string ("") and that would remove the image. If the image is directly on the page, there isn't currently a way to remove it. Is it possible to delete objects? I haven't found anything in the documentation about deleting objects, but i want to be sure. I plan to write a macro for a page that deletes images older than e.g. 24 hours, but at the moment i do feel that there are more difficulties than just the missing function for deleting objects. Onetastic is great, and very useful! Have a security question though, whether for the author or the community... At my company we're very concerned with people getting ahold of user data. Could a macro be written that would allow a user to extract the content of a person's notes and send them somewhere? Or are there safeguards within the macro language that prevent that from happening? I use Onenote v.2010 (with zero interest in upgrading) and when I try to install Onetastic on my new system, it crashes Onenote and forces the program to disable the addon. This is odd because I have used the two together just fine in the past. Is there a specific version needed for 2010? rallenr: No Office 365 license is not required. Email support@getonetastic.com so that we can troubleshoot. Is an Office 365 license required for Onetastic? I understood that OneNote was free to use (as I have been for a number of years). Installing Onetastic on a brand new HP laptop (64-bit) produced nothing new in the application (like the expected toolbar), nor was it then able to load the SortPages macro. Starting OneNote from the Onetastic install window button did not work. The download link from the blog help page for an update also did not work. Stumped. The macro works perfectly in the One Note desktop version. Is it possible to use it in the One Note App for Tablet? Has anyone ever used OneNote for the "Getting Things Done (GTD)" task management system. 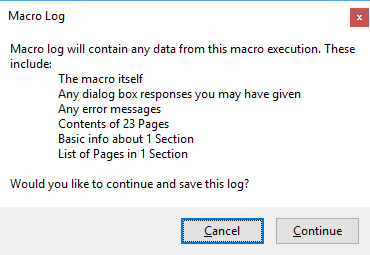 If so, does anyone have any suggestions on MACRO's to download that would make the process more automatic and streamline. When I complete a to do item on my @work section, it will automatically update my project that that task is coming from and add a new to do item on the @work list from that same project. I want to ask if there is a macro which enable to calculate the number of the adding, modification, or deleting in a page, section or even bloc-note ? Est ce qu'il y a une macro de calculer le nombre d'ajout, modification ou suppression sur une page, section ou même bloc-note ? plz, the macros in which language are programed ? Thanks Omer. Yet when I select a page in a section, which has multiple pages, and I select to print, say, Page 1, it prints the first page in the section, not the page I'm open to. Does this make sense? I would like to be able to select any page to print in a page I'm open to. Perhaps I just don't know how to get OneNote to do this. 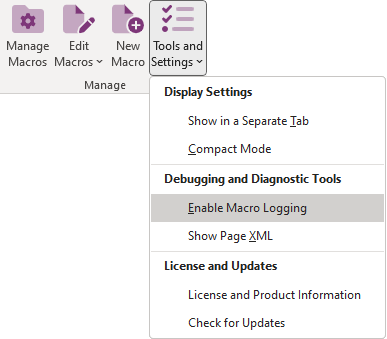 JBM: Macros don't have any feature related to printing but you should be able to just print the selected page with the built-in print option. Dear Omer: Hope all is well. Is there a macro that would allow me to print just one (1) page, say, of a multi-page section? Much like Word's print selected pages feature. Many thanks again for your help,. Hello, Blackboard Macro is awesome, and I love the dark theme so the white background isn't blinding my eyes. It seems either I misunderstood what this product can do, or, it's not working correctly. When I start a new page, and I select Blackboard as the background, from Background dropdown, the heading text is white, and says Blackboard by default, and can be overwritten by white text without an issue. However, the paragraphs use black as the default. I looked at the macro code, and it does show that it is choosing the white font (#ffffff) for all paragraphs... my theory is, that because no paragraphs have been started yet, nothing is converted, and so it uses the normal default style (which is black) to start a new paragraph. How can I get it so it always uses the white font by default when starting a new page and paragraph? vanz99: Win 10 app does not support add-ins currently. If Microsoft adds add-in support for Win 10 app it may be possible for us to develop Onetastic for it. Yes would also like to know if onetastic will eventually work for ON for Windows 10. And if so, would the purchased license transferr over. What will happen when OneNote 2016 will disappear (in 1919)? Does it work with OneNote for Windows 10 (the app)? i need a macro that will show a comment box when hover. Philippe: Currently only single line text boxes are available. We can add this request to the backlog. Is there a way to insert multiple lines in a text box in a dialog box? In fact, I would need like a multi-line (memo) box to accept plain text from the clipboard. Is this something you can add to the "wish list"?